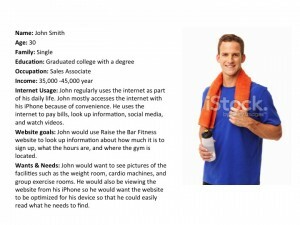 In this tutorial we will be focusing on creating user profiles for our example project website Raise the Bar Fitness. As web designers/ developers we should research who we are making our website for. If we can provide all the information that our users want then we are providing a good user experience which makes our website successful. Why should we make user profiles? User profiles are a good way to remind you who you are making the website for. If you understand who your users are, you can provide all the necessary information that they need. For our example of Raise the Bar Fitness, can you think up who would want to visit our website? These are some possible answers. Each of these users have different wants and needs, it is up to us the web designer/developers to uncover what those wants and needs are so we could provide the necessary information to answer any questions that they may have. How do we make user profiles? There are many ways to make user profiles but the easiest way is to just put yourself in the shoes of your users. If you were going to a website to look for a gym what would you want? Then you can create your user profile by using any word processor such as MS Word. For our example of Raise the Bar Fitness I have created three users profiles to illustrate to us who we making this website for. I used Google’s drive to create a document and filled in some basic information. 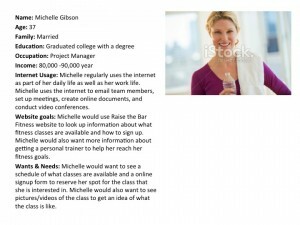 Try making some user profiles for your website.